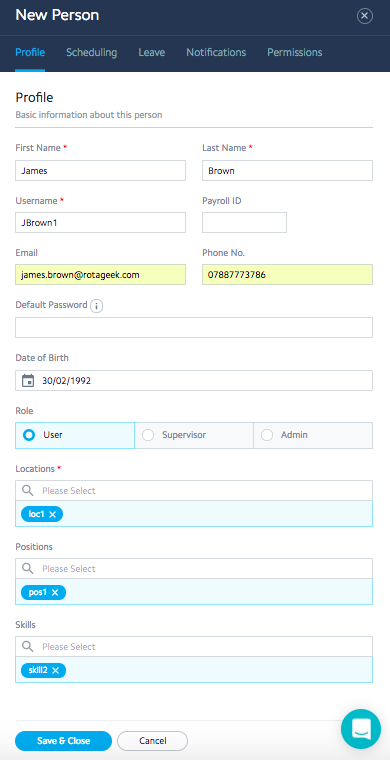 On the People Page you can add new employees, edit current staff details and delete employees from your Rotageek account. To add an employee click 'Add Person' on the top right of the People Page. You will then be presented with a screen in which to input data. When adding an employee the minimum data you need to add to create a new user is: User Name, First Name, Surname and to tag an employee to their location(s). We recommend tagging adding their position(s) and skill(s) as well. You can also input data for Scheduling, Leave, Notifications and Permissions (add hyperlinks). Click on these to learn more about these fields. Navigate to the People Page, and open the profile of the relevant employee. You can then edit their information. To learn more about the specific fields follow the links above.